Can I tell you guys a secret? We’re moving to Portland. Like, this weekend. I know. We’re nomads. Get used to it. If you’ve followed Minimalist Baker for any length of time, I suspect you’ve had a hard time placing a finger on where exactly we are at any given time. We were married in Kansas, moved to Oregon, moved back to Kansas, now Missouri, and now back to Oregon. Whoof. I would be confused, too. But you know what? That’s OK. Life ebbs and flows and interests swell and dwindle and we as people change. It’s no wonder our addresses change, too. Since leaving Portland in 2011, we’ve missed it dearly. A few vacations back confirmed that fact. So we’re packing up and heading west (again). And we’re kind of excited about it. This change doesn’t mean much for you guys! (I think we’ll still have Internet in Portland, wink wink). It just means we’ll be in a new place (follow John and me on Instagram to watch our transition), inspired by new surroundings, doing new things. Among the many, many things I’m grateful for this Thanksgiving season, that is certainly one of them. 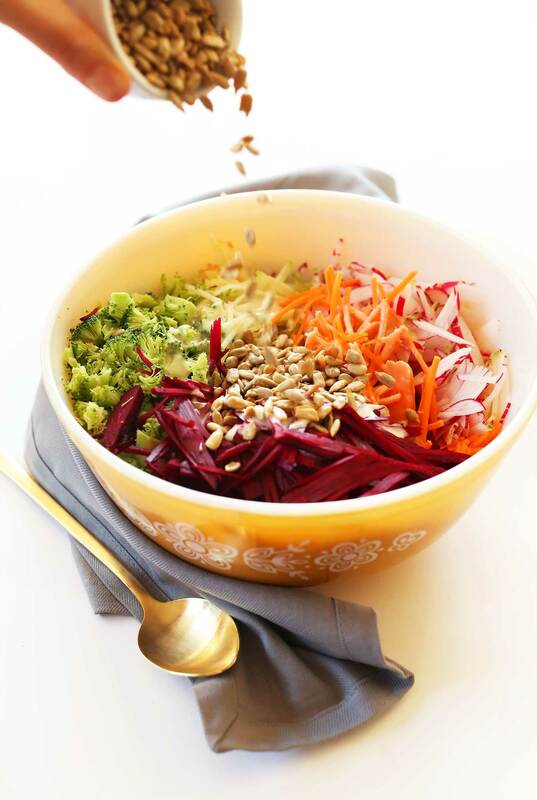 Enough talk about moving, and more talk about this amazing slaw. It’s loaded with fruits and vegetables in just about every shape and texture, and topped with a seriously delicious tahini-apple cider vinegar dressing that brings the whole thing together. Unsalted sunflower seeds pack extra nutritional punch and plenty of protein. Also? 30 minutes is all you need to make this holiday-worthy dish. What’s even better about this dish is you can make it a day or so in advance and it just keeps getting better as the flavors meld together. That’s my kind of recipe. As always, if you give this recipe a try let us know! 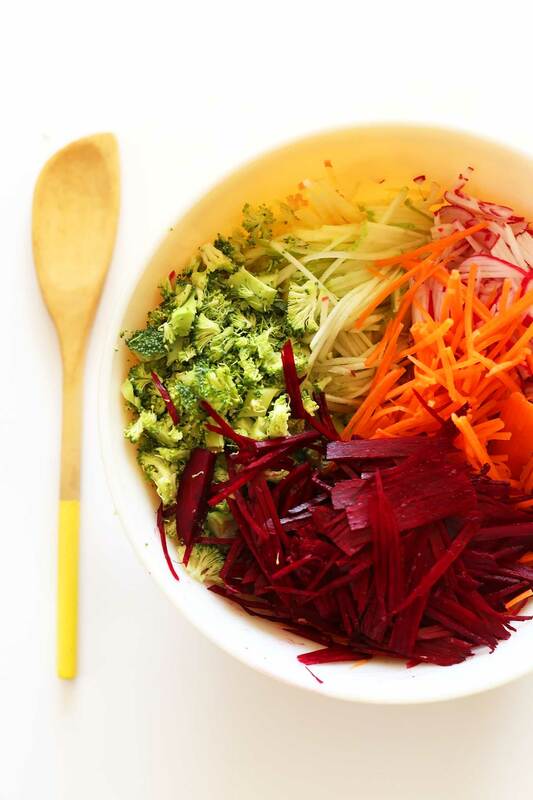 Take a photo and tag it #minimalistbaker on Instagram so we can see your beautiful slaw this holiday season. Cheers! 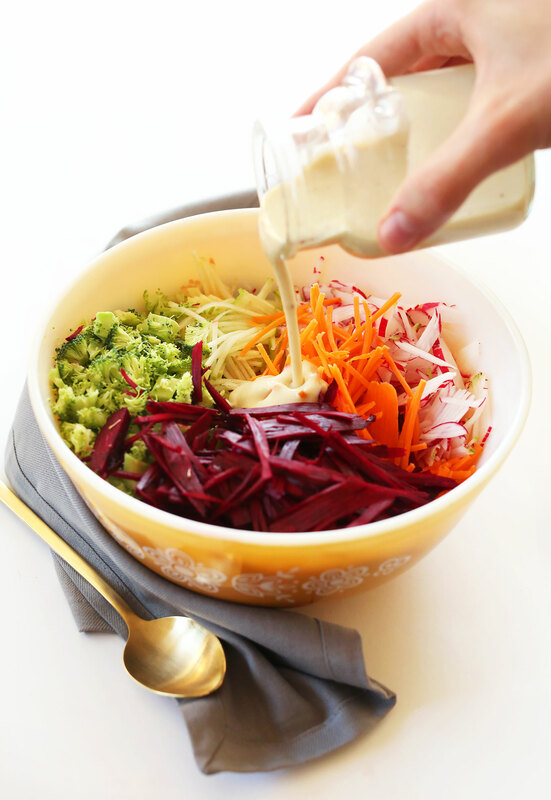 A healthy slaw loaded with fall veggies and fruits and a tahini-apple cider dressing! Crisp, refreshing, and comes together in 30 minutes. Prepare all veggies and add to a bowl. I used this mandolin and it went so fast! Otherwise, a sharp knife and some patience, or a food processor with a grating attachment would work brilliantly. Whisk dressing ingredients in a small mixing bowl and taste and adjust seasonings as needed. Add dressing to veggies, along with sunflower seeds, and toss to coat. Chill for at least 1 hour before serving, preferably 2-3 hours or up to overnight. Store in the fridge covered for a few days, though best within the first 24-48 hours. This recipe looks fantastic and I can’t wait to try. For the broccoli and beet, do I use raw or cooked? I made this for Thanksgiving, and it was delicious! It was such a nice fresh, crunchy contrast to all of the heavier dishes on the menu. I have one question, though – my slaw looked kind of dull and ‘grey’ compared to your vibrant dish. Have you ever had that problem? I wondered if I hadn’t thinned out my dressing enough, but judging from your photo, it is a pretty thick dressing. Then I wondered if maybe I should have kept the beets separate until right before tossing/serving so the color wouldn’t run all over the other veggies? As I said, the taste was amazing. If you have any suggestions to make the presentation a little more appealing (like your beautiful photos), I would greatly appreciate it! Thanks for another great recipe. You never steer me wrong! I’m hoping to make this for thanksgiving! Will the apples brown if sliced a few hours before serving? Made this salad for dinner last night and it was a total success. Love that I could use up all the veggies I had in my fridge and the result was fantastic and delicious. Its so simple to make too, Thank you Dana! This salad looks delicious. I have what some might say is a silly question, but here it is: is the beet raw or cooked? Congrats on the move! I recently made the big jump from the US to Europe, and it had its challenges, but also many great new perspectives and experiences. Almost finished with your photography course. Must say I’m impressed with the quality of videos. Your instructions are well thought out, and very helpful. I was craving beets today so off I went to the minimalist baker website to see what Dana does with them! Possibly the best ‘salad’ I’ve ever made (ok, I grew up in a country where the word ‘slaw’ does not exist!). I subbed chives for the red onion, steamed green beans for the broccoli and raisins for the apple and also added chopped fresh mint leaves and some vegan parm (cos vegan parm just goes with everything!). I had it for lunch and it was so so good I’m probably making it again for dinner tonight! Wonderful! Thanks for sharing, Annalise! Just to make sure, do you use raw beets ? What a beautiful blog! 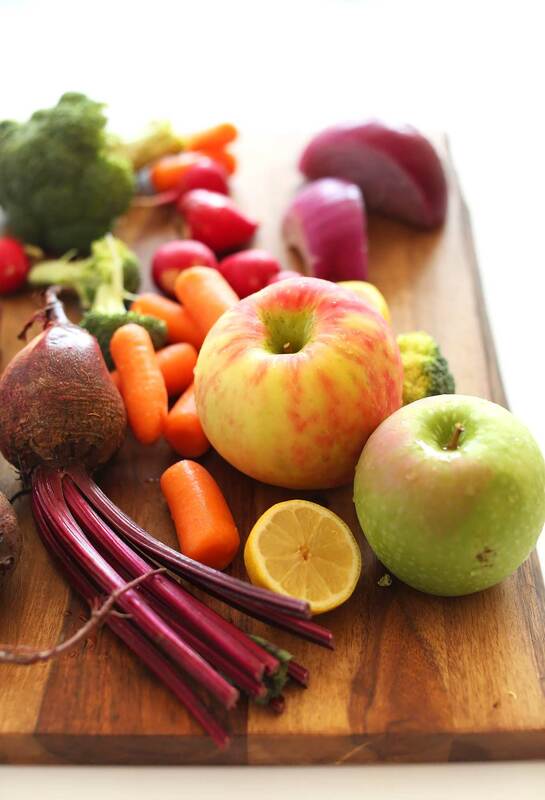 One quick question… The beet and brocoli are raw or boiled? Made this for a holiday gathering….skipped the radishes (I’m not a huge fan) and just used a plain old cheese grater for everything except the broccoli, which i sliced thinly then chopped. My family loved it! I did too, and it still looked great sans mandolin. I went for 2 tbsps of maple syrup, and next time I think I’ll do just one, but my family disagrees and liked the extra sweetness, so there you go. Thanks for your great recpes! What an amazing recipe!!!! I can eat this salad everyday. Huge success with all the family. Thank you! Glad to hear it! Thanks for sharing, Ana. Congrats on the move! We moved to Portland 7 months ago from San Francisco and couldn’t be happier about it. And it’s so much fun discovering all the great food in a new city. Welcome back! Lovely! Hope to do a meet up at some point to meet all our Portland followers! This slaw looks delicious! I fell off the Minimalist wagon for a while as I have been traveling since Oct. 30. Congrats on the move from someone who can appreciate relocating! This salad looks fantastic. I need to make it. I’m obsessed with tahini dressing. Also, congrats & good luck with the move!! Super exciting. This is exciting news for you two!! I think you guys belong in Oregon, stay a while. :) I adore Portland, and am so glad it’s just a mere 3 hr drive from my area in Washington! 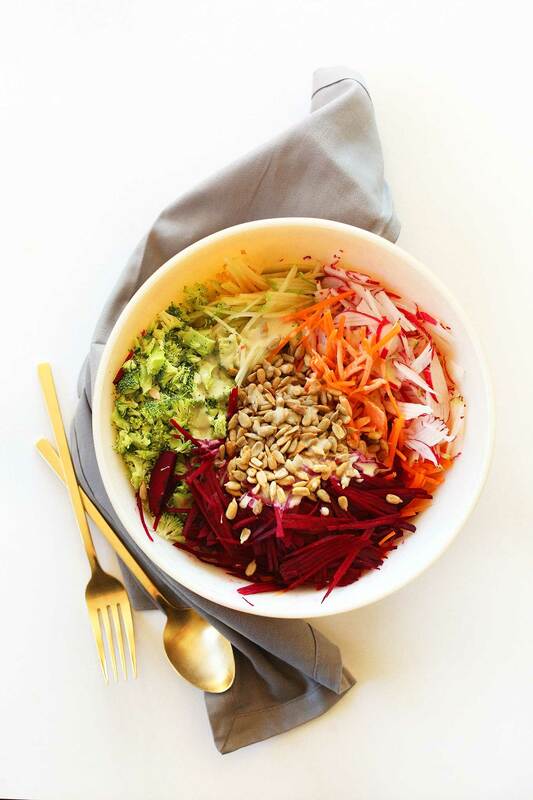 This slaw looks DELICIOUS! Fall has come and gone in Minnesota, but this was so quick and easy I had to try it. The dressing was amazing and the veggies were super fresh. For anyone needing reassurance that the raw beets worked perfectly, this is it! Ah yay! Thanks for sharing, Kelzee!! Portland is a special place…. ‘call it art – stick a bird on it’ or something like that!! ;) I’m not from there, but have fond memories of family trips in the area. Safe travels!! Recipe looks marvelous but I spotted a red onion as well as radishes in the collection of ingredients-but not in the recipe. Also what do you use to get even matchstick portions.? I would like to make it for Christmas. 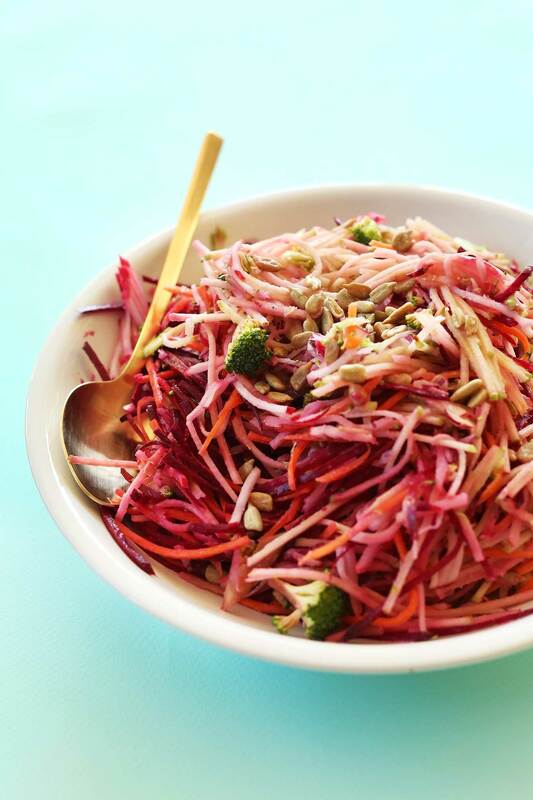 yes, I saw red onion listed as an ingredient… this slaw looks pretty yummy! Yay, so happy for you guys! Portland’s one of my favorite places on earth. Oregon in general, really. The agriculture alone makes it a great business decision, right?! Yum!! I saw this and right away, I knew I would want it. I haven’t tried beets, but the more recipes I see with them, the more I’m kinda thinking I should. And this recipe I am definitely making!! It looks to be an extremely versatile recipe, so I am sure there are a million and one different takes you could do on it, depending on what veggies were available. haha, that’s awesome! That sounds like it would be one epic Portland blogger meetup! Any favorite vegan spots in Portland you recommend? I’ll be visiting Portland for the first time over Thanksgiving! 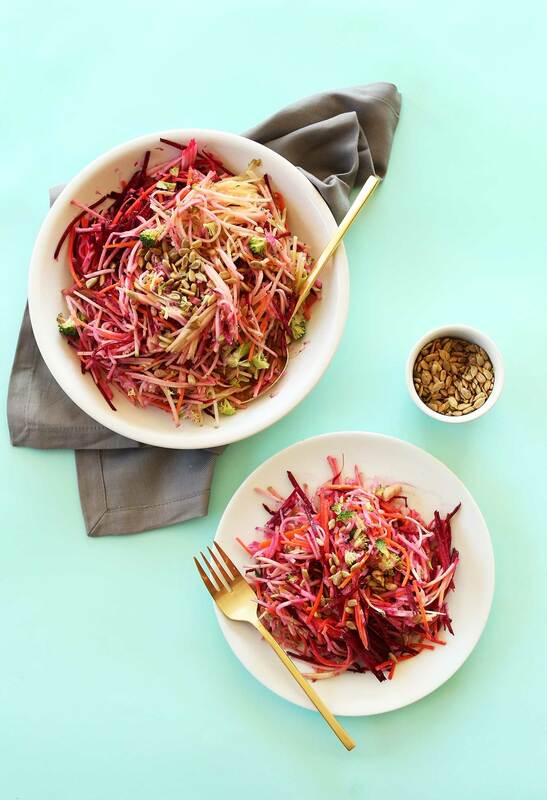 Such a fabulous fall slaw! I bet this is great on sandwiches too! I love Portland!! Safe travels back to Portland!! Ok Dana and John I love your recipes but I feel if your in Portland that your inspiration is going to be so different then it is now (or maybe not)all im trying to say is Hippy food hell yeah! Im so excited to see what your going to end up creating. Communal approved.Have a groovy day. Thanks Elizabeth! We will have the same vibe moving forward, just with more local produce and general awesome hippie-inspiration going. Hope you love what’s to come! Sweet Pea! Is that the bakery? AAAAHHHHHHH Portland!!! The homeland! Born and raised. I live north in Spokane now but the fam is still in OR and there is no better state. Good luck with moving and I am so excited to see updates during this journey! Also, congratulations, you two, on your move back to the PNW!! It’s where my home and heart is; I can’t imagine living anywhere else. It’s the most beautiful place on Earth! Wishing you both an easy more and fun trip up! I’m glad someone else asked this question, because I was struck with the same thought… does she really mean raw beets! But if you say so Dana! I will try anything you recommend! Good luck with the move :) This slaw looks amazing. Pinned! Good luck on the move, love Portland! 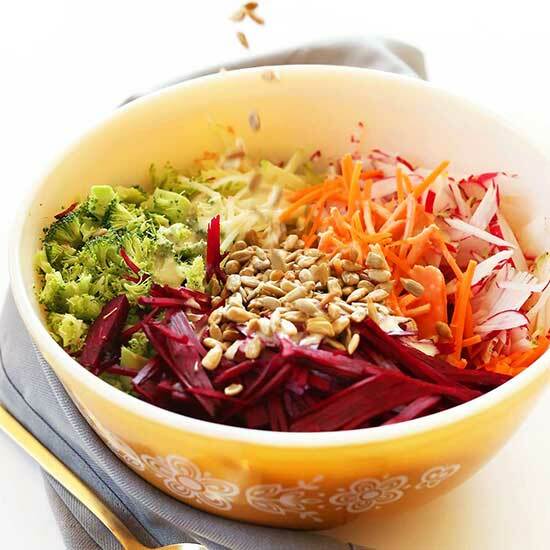 This fall slaw looks great, a perfect lunch! Think I’ll make this for thanksgiving! Any suggestions on a broccoli substitute. I have some haters to deal with. broccoli haters? Oh no! You could substitute cabbage, or just extra of all the other ingredients! Thanks Jennifer! Seattle has part of my heart, too. Let us know if you’re ever in the area and we’ll try to announce when we’re up in your neck of the woods, too! AHHH you’re moving to Portland? You should totally do a meet up! I would love to meet you!!! If it wasn’t weird I would totally invite you and your hubs to the Friendsgiving my house is hosting this weekend but a) that sounds creepy b)you’ll probably be so swamped because moving is stressful and c) hanging out with a bunch of college kids who tried to make a turkey would probably be pitiful. But yay for moving to Portland! So so kind! Thanks for the invite. Things will be pretty hectic as we likely won’t get all moved in until late Monday. But I love the idea of a meet up! We’ll try to make that happen soon! Lucky you!! My husband and I lived in Vancouver, WA (just outside Portland) for 8 months and loved it! Everyday on our way to work, we would see the most beautiful silhouette of Mt. Hood as we crossed the bridge into Portland – also, go to Kells Irish Pub, it’s awesome :) If it weren’t for the job market at the time and the fact that all our family and friends live on the East Coast, we would definitely go back! Thanks Carey! Love those recommendations and LOVE Mt. Hood! looks beautiful! I have some tahini I need to use up. I think I will make this! I seem to notice some red onion in the top photo… did that not make it into the slaw or was it missed in the recipe? Thx. I believe it’s the shredded radish, but you’re right, it resembles red onion. fixed! It was red onion. This looks gorgeous! Awesome fresh veggies, love that you let them shine in this dish :) Good luck with your move! Yay! Back to the West Coast (best coast!). :) I love Portland and hope to visit again soon. I’ll be looking forward to following your journey on Insta. Sometimes I still miss My Little Celebration to read the fun daily life posts. Ah, that’s so sweet you remember MLC! Crazy long time ago it seems now. Let us know if you make it up to Portland! Thanks friend! You inspire me suh much. Hope we get to meet in person someday! Congrats on the move back! Portland is such a cool city (which you guys obviously know, haha) Have fun!!! What a beautiful slaw! Who thinks of slaw anytime other than at summer bbq’s? Not until now, I love you made a typical summer dish into a fall bowl of yum! This looks amazing! Good luck with the (re-)move to Portland! This looks amazing! I just discovered broccoli slaw (It’s actually sad how long it took me to find it since broccoli is my favorite veggie) and love that there is broccoli here. Also, the colors in the bowl are gorgeous. I will definitely be making this sometime soon. Thanks Sarah! Yeah, broccoli is probably my fave veg of all time, though spinach and kale come in a close second and third! I am always inspired by your simplistic approach to food. I love this recipe. Looks divine!